In order for your vehicle to get you where you need to go, all of your wheels need to be pointed in the same direction: forward. When your wheels fall out of alignment, it can cause abnormal wear and result in expensive repairs. 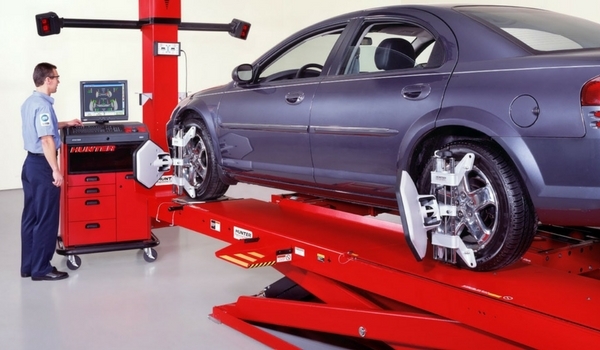 We have the technology and trained staff to accurately realign your wheels. Improve performance and avoid expensive repairs by scheduling your alignment appointment today! Proper alignment increases safety and saves you money. You’ve probably heard the word “alignment,” but might be confused about what it means. Your vehicle’s wheel alignment is the position of the wheels in relationship to the rest of the car. In order for your vehicle to drive straight down the road the tires must all be pointed forward. Most vehicles have toe, camber, and caster adjustments. These terms describe different angles to which the wheels can point. If any of these adjustments don’t meet specification, you may experience a pull when driving, as well as abnormal tire wear. Why is Computerized Alignment so Important for My Vehicle? If there’s a problem with your vehicle’s alignment you may experience a pull while driving, the steering wheel may not be straight, and the tires can wear abnormally. By “abnormally” we mean more wear on one part of the tire, and usually excessive wear. This means you’ll need to replace tires sooner than if you didn’t have an alignment issue. It’s clear how proper alignment can both improve the safety of your ride and save you money in the long run. When Should I Bring My Vehicle In for Alignment? There are a number of things that will signal an alignment is needed. The first few are easy: feeling a pull or the steering wheel being off are both signs you need an alignment. The other common symptom takes more of a trained eye, and that is abnormal tire wear. Tires will often wear more on the outside or inside edge if the alignment is out of specification. An alignment is also recommended after suspension work because the new parts can affect the angles in the suspension, which changes the alignment. A vehicle alignment is a good idea after having tires replaced — the alignment will make sure your new tires wear evenly and last as long as possible! The first step to checking alignment is to take the car for a test drive. During the test drive the technician will identify if there are any noticeable problems with the alignment, such as a pull or crooked steering wheel. After the test drive the vehicle is put on our alignment rack, and sensors are installed on each wheel. The vehicle information is entered into the computer to retrieve alignment specifications. A special camera then checks the position of each sensor to determine the exact position of each wheel, down to 1/100th of a degree! The computer displays the angle of each wheel in real time as the adjustments are made. Once the adjustments are completed, the sensors are removed and we print out specifications that display what your vehicle alignment was before we made the adjustments and what it is now. The final step is another test drive to be sure everything is properly adjusted. At Alexander’s saw a need to provide our customers with alignment services. A number of years ago we made the investment in an alignment rack, including computer software and training for our technicians. 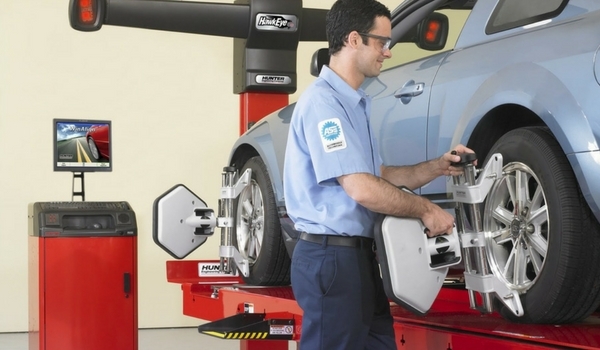 These tools allow us to quickly and precisely adjust alignments for all modern vehicles. We’ve performed thousands of alignments on hundreds of different cars, and are your go-to alignment experts.